Mrs. Chung decided to browse Quill Lessons because her students often struggled with transition words. She chose a lesson on conjunctions of time to encourage students to better represent the order of their ideas. Here's a step by step guide for how Mrs. Chung implemented her first lesson. Mrs. Chung went to the explore all activities page and typed "conjunctions" into the search bar. She decided to preview Lesson 1: Conjunctions of Time (After, Until, Before, etc. ), so she clicked on the name, and read through the slides and Step-By-Step Guide. Since the objective and content aligned with her goal, she assigned the lesson to her 4th period class. Here's a guide on how to assign Quill Lessons. As soon as Mrs. Chung assigned the lesson, she received an email in her inbox that contained a PDF of the lesson plan. The lesson plan listed each of the prompts and suggested discussion topics. She printed out the PDF and annotated the discussion questions to use during the lesson. Here's a sample lesson plan PDF. As her class was walking in the door, Mrs. Chung pressed the “launch lesson” button from teacher dashboard. She noticed that both the slides and the interactive teacher guide were showing up on her board. By clicking on the projector view button at the top of the page, she launched a new window that showed only the student display. She dragged this new window off to the right-hand side of the screen, so it would appear on her projected screen, but her desktop still showed the teacher view. 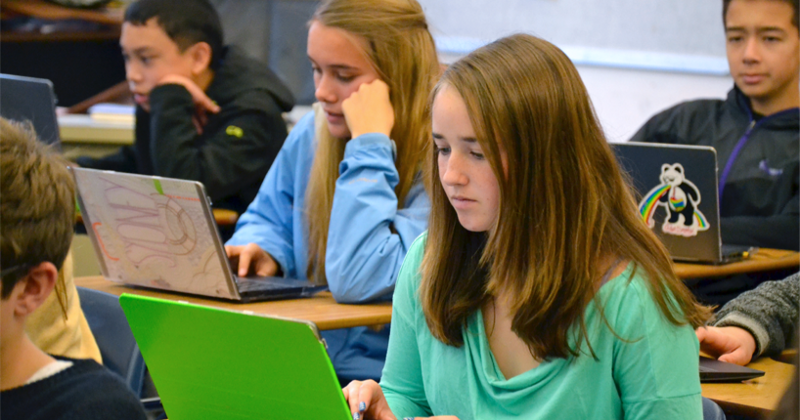 Here's a guide on how to project Quill Lessons in your classroom. Each student signed into their Quill account on their laptop at the beginning of class. Mrs. Chung watched as each student joined the class, and populated the "0 students connected to this lesson" field on the right of her screen. If Mrs. Chung did not get her lesson open before students login to their Quill account, the lesson would show up as locked on their profiles until the teacher pressed the “launch lesson” button. It would then unlock on their profile and display on the dashboard. The students could then click on "start lesson." Mrs. Chung started her lesson, and used her step-by-step guide to prompt student responses and involvement. She came to a Teacher Model slide, and decided to demonstrate how to connect two ideas together. She used the “watch teacher” button, which paused student screens, and instructed students to partially close their laptops. She then typed out her answers on her laptop, and thought aloud for her students as they saw her changes live. When they came to the first question, each student entered an answer. Mrs. Chung selected a few strong answers to project to the students. She used the questions she had annotated in her PDF to guide discussion around the student answers. For each individual practice slide, Mrs. Chung projected strong student answers to help the students discuss and understand the material. After sharing a few strong answers, she used the "retry question" button, which allowed all students to start over and submit a new, improved answer. During the lesson, Mrs. Chung noticed that a few students were consistently struggling to apply the new material in Individual Practice. She used the flag button to mark these students. As she progressed through the slides, some of flagged students demonstrated mastery and others did not. At the end of the lesson, she was presented with options - she could either send all students to independent practice now, or send some to independent practice and pull others aside for small group instruction. Mrs. Chung assigned 25 of 30 students to start the independent practice, and prompted the remaining 5 students to join her at her small group table. She asked her small group to write down a few of the prompts from her PDF in their notebooks and walked through the process with them once again. She engaged each student in a discussion around improving one another's answers. As her small group worked, she provided personalized feedback based on their responses. During the small group instruction, the rest of the class worked independently on their follow-up activity. Ready to Jump In? Check out the checklist for completing your first lesson. Decide if you will use Quill Lessons with a small group or the whole class. Consult the diagnostic recommendations for whole class lessons. Filter by Quill Lessons tool tab under Explore All Activities. Have questions about which grade Quill Lessons is suitable for? Here's a guide. Download and print lesson plan. Here's an example lesson plan. Practice projecting student view, and using teacher view. Here's a guide. What is the relationship between the parts of this sentence? What are all the joining words we could use to connect these ideas? How are the sentences you can see different from one another? How are they the same? Which of these responses would you use in your writing? Why? What might change your choice? How does the sentence structure change the meaning? How could I correct this response? How could I improve this response? What rule could we write to prevent this writer from making this error again? Which of these responses sounds better when you read it out loud? What vocabulary would you change to make this sentence your own? What is the writer communicating with their word choices? Over the past month of beta testing, we’ve seen teachers in action and gathered their stories of making Quill Lessons work for them and their students. Here’s how we gathered these ideas and best practices.